The expression suggests that when someone is willing to invest more initially, that individual is more likely to recoup greater value, either in higher quality or performance. Organizations that invest in workforce development reap the benefits with higher levels of employee engagement, performance and innovation. But what happens when there’s a disconnect between an organization’s desire for well-educated employees and its support for external learning and development opportunities? According to research conducted in April by Chief Learning Officer magazine in conjunction with the Human Capital Media Advisory Group, the magazine’s market research arm, more than three out of four (78 percent) respondents said their companies encourage education outside the organization (Figure 1). Yet, less than one out of four employees (23 percent) actively seek outside education. That may be because the support employees can expect from their employers as they pursue advanced degrees, certification and other external development opportunities varies widely. For instance, only 51 percent of organizations offer tuition reimbursement to all employees, with 28 percent only offering it on a case-by-case basis (Figure 2). Resource availability was the No. 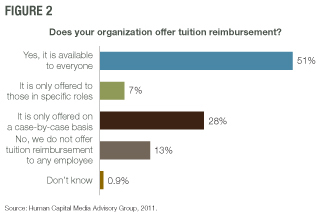 1 reason organizations did not offer tuition reimbursement, with 58 percent saying it wasn’t in their budgets (Figure 3). Cost cutting from the recent recession may continue to dog CLOs’ footsteps. But what about the 26 percent of respondents who said their organizations don’t offer tuition reimbursement at all because it’s not seen as a priority to employee engagement? Consider that statistic in conjunction with this one — 24 percent agree that getting an MBA or other graduate degree has little to no impact on advancement in their organization, while 56 percent disagree. Thirty-three percent agree that getting an MBA or other graduate degree has little to no impact on salary in their organization, while 40 percent disagree. According to the data, the perceived value of advanced education from the employee’s perspective is there. Organizational support is another matter. Companies were almost evenly split when asked if employee education is an investment or a benefit: 49 percent said it was an investment, and 51 percent counted it as a benefit. Respondents were split over whether or not they factored external education into organizational capabilities assessments, 47 percent did, 43 percent did not, and 10 percent don’t know. Not factoring this learning investment into organizational capabilities assessments suggests ambiguity or indecision around the level of importance for external employee education, as does the indecision between cost and benefit status. When learning and development departments do commit to external education, however, learning leaders go all in, playing various roles — administering programs, choosing the best university partners, selecting eligible employees — to ensure academic partnerships are beneficial for all parties. To get what they pay for, organizations may have to put their money where their mouths are to actively support employees seeking external education opportunities. Kellye Whitney is managing editor of Chief Learning Officer magazine. She can be reached at kwhitney@clomedia.com.